It was Alexa Middleton’s first day at Riverdale High School. That was by far the biggest school she had ever gone to — one that she was attending for the purpose of basketball. Middleton was set to begin her high school career in the fall of 2010, but first she had to get comfortable with her new surroundings. She ate lunch in the bathroom. As is the case for many, the high school experience was filled with ups and downs, as was Middleton’s college career. Specifically, the one that she ended with her senior year at Iowa State. 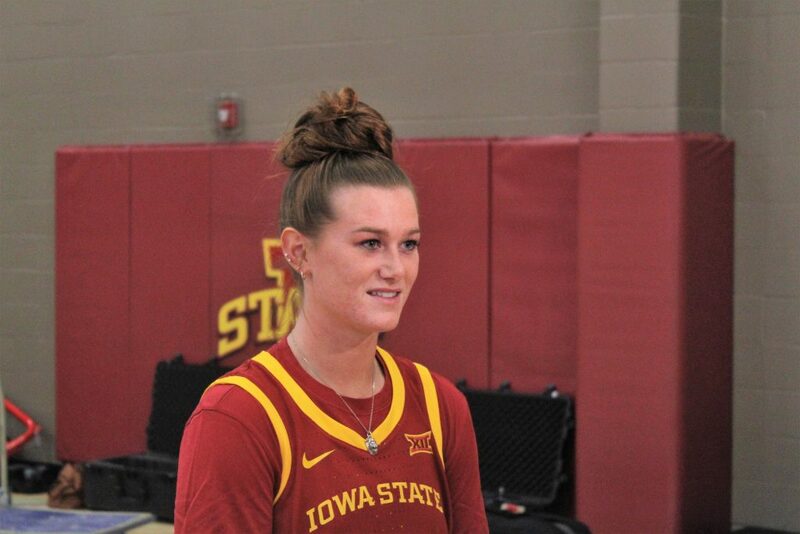 After a three-year career at Tennessee, Middleton decided to transfer to Iowa State and sit out for a season before playing her final year of basketball for Bill Fennelly and his staff. The Cyclones, to Middleton, were no strangers. Transferring is more unique in women’s basketball, especially when you consider how many were on some of Fred Hoiberg’s men’s teams at Iowa State. An example, Hoiberg’s 2013-14 team included seven of them. Billy said that when they’re pitching recruits, Iowa State’s history makes it easy. Iowa State has ranked in the top four in the nation in attendance for women’s basketball in each of the past 11 seasons. That was part of what Middleton looked at when picking out a school and part of what she talked to her high school coach and mentor, John Wild, about. Believe it or not, the path that led Middleton to Ames for her senior season goes back to the late 1980s. Wild was playing for the men’s basketball team at Lipscomb University and at the same time, Middleton’s mother — Celeste — was playing for the women’s squad. Wild and Celeste got to know each other and kept in touch over the years, until Middleton was eventually playing on the AAU circuit leading up to her high school career. As the years went on, Middleton began competing on the AAU circuit. It’s something that most college players will do at some point either while in or before their high school careers. Some of Middleton’s AAU teammates were players that would go on to Murfreesboro Riverdale High School. The head coach there? None other than Wild. The next thing he knew, Middleton was transferring from the private school of Middle Tennessee Christian to Riverdale, where she would spend her high school career. Aside from her first day, Middleton’s time at Riverdale brimmed with success. Middleton led the school (with the help of Wild) to two state championships in her junior and senior seasons. She was rated as a five-star prospect and even played in the McDonalds All-American game. There was a lot to like about Middleton, which was what led her to being recruited and eventually committing to become a Lady Vol at Tennessee. Alexa Middleton is interviewed at Iowa State Women’s Basketball Media Day. Middleton sat out last season after transferring from women’s basketball powerhouse Tennessee. 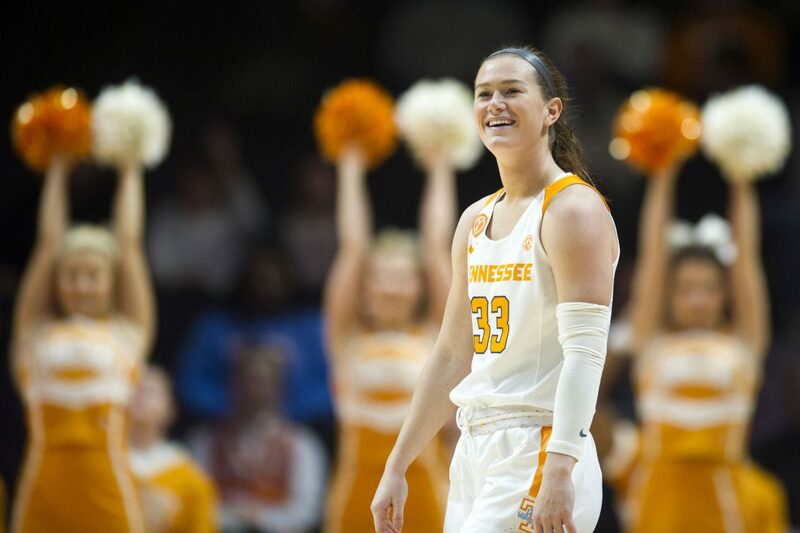 Middleton’s junior year at Tennessee was winding down and the Lady Vols had just been upset by the SEC’s 12th seeded Alabama Crimson Tide with the NCAA Tournament looming. That’s when Middleton reached out to Wild about the possibility of transferring schools. Middleton knew what she wanted. “I feel like she wanted to be developed more as a player, and I don’t feel like she was getting that at Tennessee,” Wild said. Middleton eventually sent in her release and the first coach she talked to was Billy Fennelly. That quickly got the ball rolling. 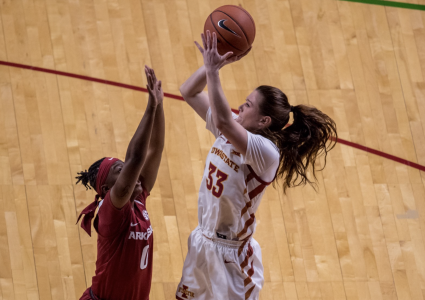 Her transfer became public on April 21 and just over two months later, Iowa State announced they had landed the Murfreesboro, Tennessee native. Even before the Cyclones were recruiting Middleton, they had gotten a head start to things. Billy and the rest of the staff were instantly in love with Alexa Middleton. They took every measure to make sure that Middleton would end her career while wearing the cardinal and gold. Things were winding down, which is when Bill reached out to Wild. Wild pulled off of the road because of how hard it was raining in Murfreesboro. He pulled into a small church off to the side of the road that had a wrap-around drive and a huge awning over the front door of the building. Wild sat under that awning where he talked to Bill for the first time. “[Bill] said, ‘First off, I want to know if you feel like we have a chance,’” Wild said. The high school coach, to Bill’s advantage, is a basketball fanatic. Wild sent Billy a text as well. He was the lead recruiter on Middleton, of course. Billy made his final pitch. It turned out to be exactly what Middleton was looking for. 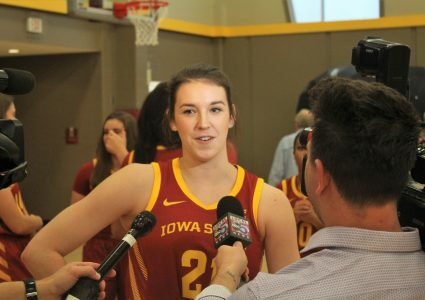 Billy said she wanted it to be straight to the point – Iowa State put up what they had to offer and basically left Middleton to take it or leave it. Middleton made it to Iowa State ahead of the 2017-18 year and due to transfer rules, would have to sit out a season. That meant no games. No playing in front of the Hilton Coliseum fateful. All she had to motivate her were the banner-filled walls at the Sukup Practice Facility to dream about during practice for a full year. Middleton used the year off to her advantage. According to Billy, it was nothing but productive and the would-be senior got better as her confidence grew. If she has the same impact over the next two months as she did at this time last year, it’s going to be a lot of fun to watch,” Billy said. Things were going great for Middleton — all things considered. Then, her career took a detour, and she would have to take a step back. “We started to get ready for postseason workouts and we didn’t really know what was going on,” Billy said. Middleton came to the staff and said an injury to her left knee was flaring up again. It wasn’t anything that happened in one day, but rather over a span of a month or so near the end of the season. After getting things checked out, the coaching staff was presented with two options for the transfer point guard who was supposed to be essential to the Cyclones offense during the next season. “One of them was to rest her [in June], take care of it now, so that hopefully by September we’ll be full go,” Billy said. The other was to risk pushing the injury. It was a no brainer for the staff. That meant another sit-out period for Middleton. This time, she would miss out on playing in the team’s summer trip of tune up games in Costa Rica. It was frustrating for her. This was her last year of her college career and she wanted everything to go right. Because of the injury, she would miss the summer workouts and conditioning with the team. “I was still there, but not getting to participate in them is frustrating, because you want to be at your best at the beginning of the season and not doing what I [was doing at the start of the year]: trying to catch up,” Middleton said. Ultimately, it was the best decision for the Cyclones. Bill wanted Middleton at her absolute best during January, February, and March for the Big 12 Conference season. “Whatever days she has left needed to be the best days we can give her,” Fennelly said. Middleton’s first day back at practice following her injury lined up with Iowa State’s first practice of the season on October 8. It was one month before the team would play its season opener against Niagara on November 9. That’s a short period to try and get back into “game shape.” Keep in mind that she hadn’t played in a competitive game for a year and a half. Middleton suited up and started for the Cyclones in the first game of the season as she has in every game at the point guard spot this year. Because of the lost time and conditioning opportunities during the season, she was playing limited minutes at the start of the year. In the first month of the season, she averaged just 21 minutes per game, and it showed on the court. It was easy to see from the stands. Middleton said the fatigue was setting in and leading to some bad passes and decisions early on. She knew that Fennelly wanted her on the floor more, but her body wasn’t ready to give much more at that point in the season. Another challenge she was facing was the difference between her role at Tennessee and what she would be doing for the Cyclones. While playing in Knoxville, Middleton was the sharp shooter on the roster. She led her squad during her junior year in 3-point percentage playing as a No. 2 guard. At Iowa State, though, there would be fewer chances to shoot the deep ball, due to the position change and also the team’s system. Fennelly said that that part came quickly for her. Middleton has learned the system exceptionally well. She’s currently fourth in the Big 12 in assists per game, dishing 4.6 on average through the first 20 contests of the season. However, the 3-point statistics faltered, especially early on. Middleton hasn’t shot nearly as many threes as she did at Tennessee. During her junior year, she attempted 108 compared to the 49 she has shot two-thirds of the way through this season. The glaring number there is that she has only made 17 threes through 21 games. “I’ve got to get people in the right position to get looks for them first, and when I have the open shot trust myself and know that my teammates trust me to knock down those shots,” Middleton said. She got into the gym with Billy a lot. Instead of working on just shooting, she mixed in game-speed shots coming off of screens. That was, after all, where she has gotten most of her looks. It seemingly has been working. After a bit of a dry spell from the 3-point line entering Big 12 play, Middleton has made a long-ball in each of the last three games, shooting 6-13 (46.2 percent) in that time. Middleton, and her teammates, think that the sky is the limit as far as the success of this team goes. The next step for Middleton will be turning Iowa State’s success into something much bigger in Ames. “We want to have a championship mentality, and that’s something that’s definitely attainable for us,” Middleton said. Halfway through the Big 12 season, the Cyclones own a 16-5 record as well as a 6-3 mark in Big 12 play. They could be well on their way to hosting the first two rounds of the NCAA Tournament at Hilton Coliseum. But regardless of how the season turns out for Middleton, it will be remembered as a successful one to a lot of people. That includes Wild, who knew all along Middleton’s time in Ames would be time well spent. Middleton just kept on working. “I feel more and more confident each day with what I can do on the court and understanding what coach needs from me at the point guard position. I feel like I’m progressing every day. That’s really good for me,” Middleton said. The only chapter left to write is the one that Middleton will be remembered by the most.